This game has no right being this good. None. Super-hero licensed games are garbage. Batman Arkham Asylum changed that. So why am I so shocked at how mind blowingly good Batman Arkham City is? I have to invent a new word just to relate my love for this masterpiece! 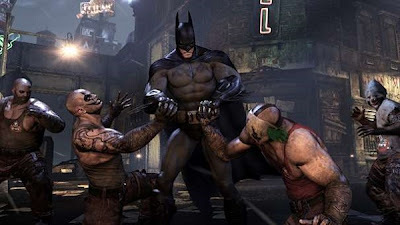 Arkham City follows shortly after the events of Arkham Asylum. Arkham has moved into a sectioned off area on the outskirts of Gotham City. Former warden, now mayor, Quincy Sharp put maniacal genius Hugo Strange in charge of running the makeshift prison. If that doesn’t sound like a recipe for disaster, how about all of Gotham’s most nefarious criminals all packed together in Arkham, and they pretty much run the joint. Arkham City is a ticking time bomb. Regardless, Batman enters to take down Hugo Strange…and of course Joker plays a huge role. Didn’t see that coming. Gotham. Gotham is Batman’s city. His playground. 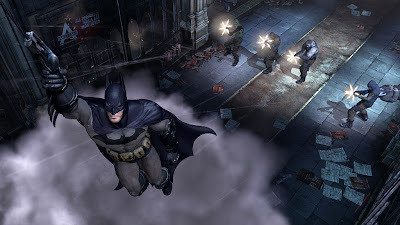 Gliding from rooftops and taking down criminals in the dead of night makes you feel truly like the Dark Knight. You are Batman. No game has ever made me feel more like the leading role than Arkham City. Developer, Rocksteady, has achieved something special here. 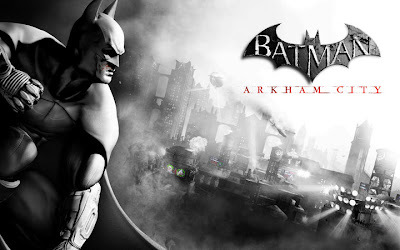 Under the impression the previous game was so good because of its linearity and focus on interiors; I was skeptical if another Batman game – open world Batman game -- would flourish and outshine Asylum. We have a perfect example here of never speaking to soon, Arkham City is open to your leisure but I never felt overwhelmed or unfocused on the main story. How you stalk crime in the night and make a quick getaway is ingenious too. Batman moves with the most intricate animations you’ll see in gaming. Grappling from one ledge to the next is easy and intuitive, and once you get the Grapnel Boost upgrade you can glide from one end of Arkham City to the next without touching the ground. Just like Assassin’s Creed, when you are on the top of buildings you own them you’re a god. The combat on the mean streets of Gotham is satisfying from hour one. It’s all about timing your attacks and landing hits and chaining between enemies. This “ping-ponging” from one attacker to the next gives you the feeling of empowerment, and the difficulty comes from trying to sustain a constant combo to take down Joker or Two-Face’s men quicker. It’s a perfect system, one that’s simple to learn but exceedingly difficult to master. The criminals control Arkham City. Joker, Penguin, Two-Face: all have their men holding sections of Old Gotham. The story isn’t as simple as liberating one crime lord from his pedestal, Batman is faced with many challenges along the way. And there is a ton to do outside of the story. The main plot is only about 10 hours in length – don’t let that scare you, as it doesn’t seem short at all. And the many Riddler trophies, Side Missions and Challenge Rooms will keep you occupied if you’re trying to get the most for your dollar. Batman is known for his gadgets and not only do you start with the majority of your arsenal from Arkham Asylum the weapons you get throughout the game are even better. There are little touches of Zelda sprinkled in Arkham City: for each area that you’re unable to access, the Caped Crusader will later get some kind of mechanism that allows him to pass. It’s far easier to use the entire Bat arsenal in combat now. A couple taps of the left trigger sends out three Batarangs. Almost everything in Bat’s utility belt can be quick launched in a fight to give you that extra edge. And when you’re using each gadget in conjunction with the plethora of moves Batman has it’s a beautiful bone-snapping sonata. Periodically you also jump to Catwoman to fill out some gaps in the story. Most of this is largely superfluous and Catwoman isn’t nearly as thrilling to play as Batman…she’s got the looks, but not the moves. And the end of the game feels a little stale in Selina’s shoes. It’s a marginal gripe, but her inclusion didn’t add or take away enough to leave too much of an impact. Batman Arkham City tops the list of best action games ever. I shouldn’t need to convince someone to like Batman just to play the game. Yes there is a lot more to get out of a game like this if you’re already a fan. I still think the fight mechanic; awesome traversal system and tightly paced story would be just as good had this not been a Batman game at all. Batman Arkham City stands tall at the precipice of licensed comic games. Nothing comes close. Not even the original. It may be premature, but Batman Arkham City is game of the year. Be Batman. Wipe the scum from Gotham. Just get this game!